You love your new iPad, but wouldn't it be even better if you could use it to send text messages? Global.AQ for iPad, iPhone and iPod Touch lets you do just that! 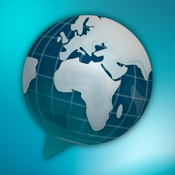 Many other SMS apps only work in the USA, but with Global.AQ, you can send SMS messages to almost any country on the globe! Click "...More" to learn why you should download this App today! "Works well between uk and nz. Well worth the price. And global to global number is free. What more can you want. 10 out of 10." "Thanks so much for this app, at least one like yours works unlike the other scams out there"
If you've been thinking your iPad is not quite perfect because you can't send or receive text messages, you're not alone. Global.AQ answers the cry of all the iFans out there who want SMS service on their beloved devices. Global.AQ brings a whole new level of enjoyment to your iPad or iPod Touch by assigning your device its very own phone number through our Antarctica Mobil Network. That means as soon as you download the app, you're available to send and receive SMS messages to or from nearly any place on Earth! You don't think you need a separate SMS service because you can send text messages from your iPhone? Just try sending large numbers of messages through your regular carrier and you'll see how quickly the charges can add up! Global.AQ sends the same messages through your internet connection to our own server, and on to wholesale operators. That can save you a ton of cash, especially if you send a lot of international text messages! And of course, it's always free to chat with other Global.AQ subscribers. •	Available to fit any budget- Choose the Lite (FREE!) version, Standard version, or Pro version! Other SMS apps only allow you to contact people in the USA because they rely on a US e-mail to SMS feature. But what if you need to get in touch with someone Turkey, or Malta, or even Sri Lanka? Global.AQ lets you to send SMS anywhere on the globe. You'll get rock bottom rates for SMS service to places that most other providers would charge a big fee to access, if they had coverage there in the first place. Global.AQ makes it easier than ever before to contact anyone, almost anywhere on the face of the earth. Download Global.AQ now, and start saving big money on your text messaging and take your iPhone, iPod Touch or iPad to the next level! Once you have it, you'll wonder how you ever got by without it!